Cast: Johnny Depp, Helena Bonham Carter, Alan Rickman, Timothy Spall, Sacha Baron Cohen. Story: London Barber kills customers to make pies. In the black corner: Tim Burton and Johnny Depp - a guarantee for a great movie. In the brown corner: it's a MUSICAL - eurgh. This could go down to the judges. First of all, if you like musicals AND Tim Burton's movies (there must be someone) then stop reading and go straight to the cinema, because this'll be your movie of the year. However, many viewers will be distinctly turned off by either the singing or by Burton's gothic style (Batman, Sleepy Hollow etc.) - and if that happens you'll struggle to immerse yourself at all. Adapted from the successful Stephen Sondheim Broadway musical, Johnny Depp is Sweeney Todd, a barber in Old London Town out for revenge on the rotter who nicked his crumpet. Helena Bonham Carter runs the manky pie shop below and between them they strike upon the idea of giving customers a rather intrusive shave - knowworrImean - and putting them in the pies. Fray Bentos have no plans to sue. 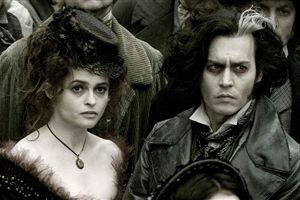 Personally I love Burton's movies (if we forget the uncharacteristic faux pas that was Planet of the Apes) and Johnny Depp is among my favourite performers - but Sweeney Todd left me cold. It's fine when the characters are chatting to each other, but just as the atmosphere is starting to build, one of them starts warbling and the illusion shatters. Not only that, the dialogue itself is largely sung, pointlessly, rather than limiting the trilling to the actual songs. They're not even very catchy tunes - I haven't been humming them as you might expect. I'm not even sure I can remember any. It's frustrating because if it had been played as a straight movie, I'd have loved it. Tim Burton's brooding scenery is typically engaging in a fantasy kind of way and the opening sequence sets the tone beautifully. All the performances are appropriate for a dark fairy tale and there's plenty of blood once Sweeney's barbery becomes carvery. Such a shame they had to spoil it. Sweeney Todd: The Demon Barber of Fleet Street is getting great reviews because it's a great musical. But it's still a musical, and at the end of the day it's that single fact that will determine whether or not you like it. I think the average moviegoer will enjoy it: 5/5 if you're into musicals. Testosterone Satisfaction Rating: 2/5 - lashings of blood and dismembered body parts, Helena Bonham Carter's heaving bosom (which changes size due to her pregnancy during filming) and light language such as piss and bugger, but the 18 certificate is ludicrous. It has 15 written all over it. To enjoy this film you should: like Tim Burton and soft furnishings. I mean musicals. 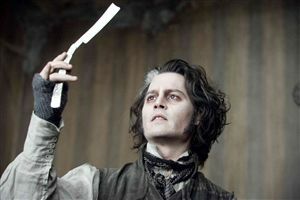 Sweeney Todd: The Demon Barber of Fleet Street was released in the UK on 25th January 2008.